This last time I added 1 cup each of hemp seed and chia seed. I started out by toasting in coconut oil the flax, hemp, chia, sesame and wheat germ all stirred in together. This had a fabulous nutty taste once toasted. I sent whole nuts through the food processor for bits instead of whole – next time a nut grinder might be better for more even chunks, but still good. I used coconut oil instead of canola oil in the syrup and I think it was much better. 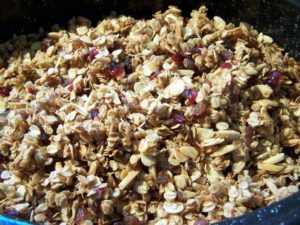 Combine the Oatmeal Mix ingredients in a large bowl. Add Syrup to the oatmeal mixture, stirring thoroughly until all is well coated. Notes: Craisens are good, dried cherries were too sweet/chewy; dried apples were good – and even better if added for the last 20 minutes of cook time so they toasted. 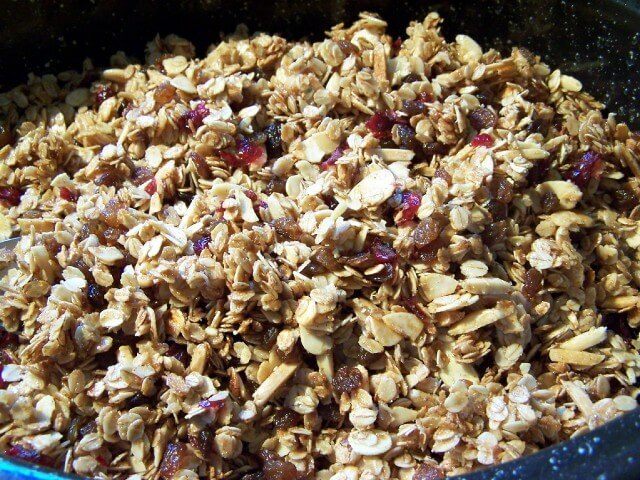 This entry was posted in Recipes and tagged Breakfast, granola on November 9, 2011 by Michelle.